Fleas are amazing creatures with a life cycle that is well suited to survival. From egg to adult can be as short as 2 weeks if conditions are ideal and up to one year if they are waiting for things to get better. The adults don’t emerge until a host (the animal or human they will feed on) is near. No wonder their populations explode so readily! Understanding how they develop will help you understand the challenges of controlling them. There is a lot of mis-information out there that can be misleading and thwart your efforts to eliminate the fleas. Adult fleas jump onto your pet and start feeding on blood within minutes. One myth is that they jump off to lay eggs or to jump onto another pet. That is not true! Fleas stay on their host their entire life unless they are removed manually. That means you have to pick them off or your pet has to scratch or lick them off. Pets often swallow the fleas. If a flea is forced to leave, it will often die. What this means is your pet is getting fleas from the environment and not directly from another animal. The fleas on your pet came from eggs in the house or outside that eventually developed into adults that hopped onto your pet. The fleas did not jump off another pet and jump onto yours. The great outdoors is usually where the problem starts because wild animals carry fleas. They leave the eggs behind to grow new fleas near areas you walk in or that your pet visits. Your pet then brings the fleas indoors. You can also bring them in on your shoes or clothes. By the time you notice them, they’ve usually been in your house a couple months multiplying like crazy! Fleas start breeding about 8 hours after they start feeding and, about a day later, the female starts laying eggs, up to 40-50 a day. These eggs are laid on your pet, but they don’t stay there. They fall off quickly into the environment. Many of them will be where your pet spends time sleeping and resting. Does your pet sleep on your bed? If so, that means you will have eggs and larvae (think maggots) sharing the bed with you! If that doesn’t make you want to get rid of fleas, nothing will. If the weather gets too cold or too dry, the eggs can die. This is rarely the case in our houses. However, during the winter when humidity is often lower, the eggs may not hatch as quickly. They may wait until conditions are better in spring. You then discover fleas coming out in full force. Larvae hatch from the eggs. These are little maggot-like creatures. They don’t like light so they tend to crawl under furniture, bedding, and into crevices in floors. This puts them into protected areas where they can happily develop into the next flea stage. They are more susceptible to drying so eggs won’t hatch if the humidity is too low. This ensures the larvae are more likely to survive. They also tend to curl around carpet fibers. This makes it hard to pick them up when you vacuum. After the larvae have finished doing their thing, they spin a cocoon. Inside is what’s called the pupa (more than one is pupae) which is the pre-adult stage. The cocoon protects the pupa from being eaten by ants and other critters. The cocoon is sticky so it will tend to stick to carpet fibers. Although the cocoons do not directly protect pupae from insecticides, most of them are at the base of carpets and in areas the insecticides can’t reach. The result is that many fleas survive from egg to adult. The adults come out of the cocoon in one to two weeks if the chances are good for finding a host and conditions are good for survival. 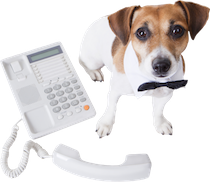 Vibrations (your pet or you walking across the floor), carbon dioxide (from breathing out), or heat will stimulate the adult to emerge. If you go on vacation and your house is empty for an extended time, the adults will safely stay in their cocoons until you return walking and breathing! They then come out in large numbers. This scenario also happens when people move into a new apartment or house that has been vacant a few months. The adults hop on to your pet, start feasting and the whole process starts over. Fleas are good at making babies. If your pet has 100 fleas, within 2 months there can be 160,000 eggs in the environment. It doesn’t take much time for fleas to be overwhelming. When you see fleas, 95% of the population is still on the floor waiting to become adults. 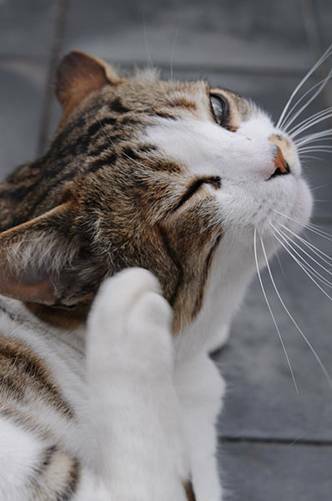 Even if it looks like your pet has only a few fleas, imagine how many are still to come! Besides being a nuisance to your pet and you, fleas can also carry diseases. Tapeworms are the most common one. Your pet gets tapeworms when she swallows a flea that is carrying them. People can get tapeworms if they happen to swallow a flea too. 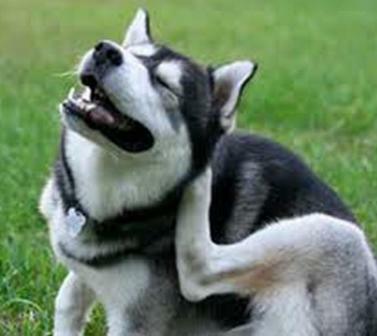 Fleas can also carry several different organisms that cause infections. Because they feed on blood, an excessive number can cause anemia. This is more likely in young or small pets. There have been pets that have died from blood loss due to fleas. These are all good reasons why controlling fleas and keeping them out of your house is an excellent idea! You can check your pet for fleas by parting the fur and looking at the skin. You may see them scurrying away. You can also look for “flea dirt”, the feces from fleas. 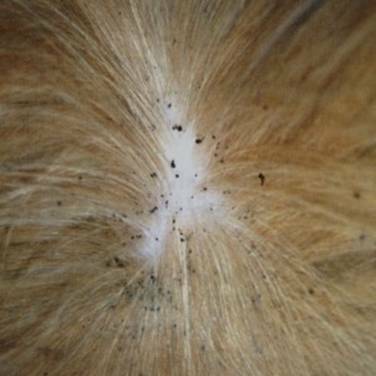 Flea dirt is dark and often comma shaped. When you place it on a damp paper towel and crush it, you will see a reddish brown color. This is from the blood the flea ate. Finding flea dirt tells you fleas are on your pet even if you don’t see them. You can use a flea comb to help you find evidence. 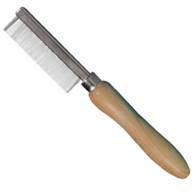 This is a comb with teeth spaced very close together. It picks up fleas and flea dirt. It works well on short-coated pets but may be difficult to use with a long or thick hair coat. If it looks like specks of dirt in the hair on the comb, it’s probably flea dirt. You can test it with the damp towel to make sure. Unfortunately, you won’t always see fleas or flea dirt when you check your pet. If the fleas are in low numbers, if you just don’t check the right spot, or if your pet is removing them rapidly, they are hard to find. This will often happen when fleas are just getting started in your house or with pets that are allergic to the fleas and scratching or licking excessively. Not finding fleas DOES NOT mean your pet doesn’t have fleas! There is no quick and easy way to do this. Realize at the beginning that it’s going to be frustrating and will take months. However, if you do everything right, you WILL get rid of them. You need to treat all pets with effective products as frequently as the product says in order to get fleas under control. Cleaning and treating the house will also help. It will stay take 2-3 months to stop the problem and you may continue to see fleas. The best way to control fleas is to start treating all your pets BEFORE they get fleas! Keep them on an effective product all year long and you won’t have to go through the agony of fleas.